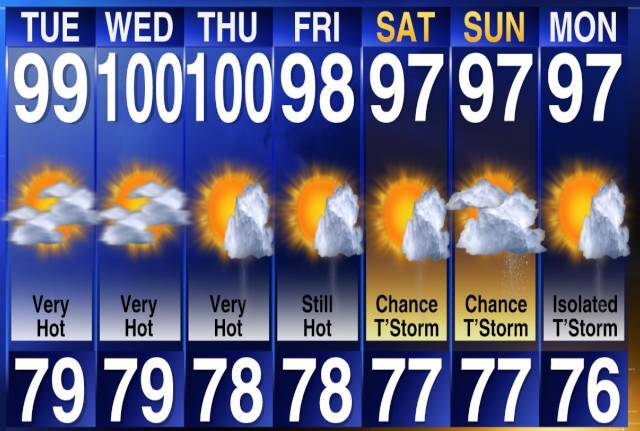 This week the forecast has been pretty brutal in Birmingham. It's not Texas-hot, but it's close. The boys and I went to Target on Sunday afternoon to see what they had on sale in the Clearance section with regard to Beat-the-Heat items. Turns out, they had a 6x6-foot inflatable pool for 30 percent off. We were on that like the white on rice. And it wasn't ONE BIT FRUSTRATING that it took more than three hours for me to blow it up once we got home. Nope. Not one bit. Once it was FINALLY ready to be filled up with water, the boys jumped in it when it only had about an inch in it. They couldn't wait. There was a lot of horseplay and even some anger ... I can't imagine WHY anyone would be angry, because when I said for everyone to dump water on his own head, SOMEONE might have leaned over and dumped it on his BROTHER'S head, instead. But the majority of the playtime was happy and pleasant. I was sitting at the table beside the pool, so I was getting eaten alive by mosquitoes. Even with bug spray on, I am catnip to mosquitoes. The boys, however, were perfectly happy and apparently bug-proof in the pool. I ultimately decided that not only was I being eaten by bugs, but I was also in danger of getting drenched to the bone by the splashing. They were throwing plumes of water sky-high, and each plume came down in an arc that was getting way too close for comfort. I decided to take my last few pictures from the safety of the kitchen. Can you see how wet the deck is? Every square inch of the deck was wet within minutes. And of course it was only a matter of time until Jakey discovered that the hose was a FANTASTIC water weapon. Luckily by that point, everyone was soaked to the bone and didn't really care about a few more drops. They went on like that for a couple of hours, and it's a big treat to have it set up right outside the back door so they can pop in for 30 minutes when we come in from school in the evenings. The way the weather runs here in Alabama, we may well get to use this into early October! I know I'd feel differently if I lived with the Alabama heat, but all I could think when I read this post was.... THAT'S SO UNFAIR! It's in the low 70s here which is strangely cold for early August. It's a reminder of days to come and we are all FREAKING OUT! Send some heat and humidity up to us, please! Don't know where Martha lives, but I'll be glad to send our hot, muggy weather up to her. I wish I had some little kids to get wet with. Good excuse! Your boys looks so happy as I know that they were. That's a really cool pool design. The boys look like they are enjoying the heat, but I will gladly swap spots with Martha! Today was ok since it rained, but it has been BRUTALLY HOT! Can't wait for Fall!